Future Ventures has got a dull response till today. The overall subscription is 1.52 times the offer. QIB section is oversubscribed 0.26 times, HNI is (strangely) 7.8 times and Retail 0.6 times. Poor response may be not just because of poor reviews (see my IPO note below) but also concurrent investments in Muthoot Finance IPO as well as the falling Sensex over the last few days. Good luck with your investments !! Future Ventures is a part of Future Group, which owns companies like Pantaloon Retail India (Big Bazaar, Food Bazaar), Future Value Retail and NBFC Future Capital Holdings, Future Generali Insurance, Futurebazaar India, etc. The core business of the Future Group is Retail, but subsidiaries are present in consumer finance, capital, insurance, leisure and entertainment, consumer brands, retail real estate development and retail media and logistics. The key promoter is the well-known Mr. Kishore Biyani. Two of these group companies are listed entities, Pantaloon Retail India and Future Capital Holdings. These two have not exactly outperformed in the last few years in the market. The short profiles of group companies show that while the ‘BigBazaar’ brand is very good, and revenue growth high, the group has not been able to translate it’s ambitious plans into profitable businesses, and benefit shareholders. Future Ventures is like a holding company, that invest in and operates businesses in ‘consumption-led’ sectors in India, sectors which will grow as the purchasing power of Indian consumers increases, and caters to their changing tastes, lifestyle and spending habits. Future Ventures has so far invested around Rs 450 crore in apparel makers, and Rs 250 crore in processed foods and consumer goods space. The Company has 14 companies in its portfolio, and owns brands in fashion, FMCG, food processing and home products. Food Processing 8. Capital Foods A food processing company with brands like Chings Secret, Smith & Jones, Raji, Mama Marie and Kaeng Thai. Fashion 13. Turtle Limited Manufacturer, distributor, exporter and retailer of men‘s wear products. Retail 14. SSIPL Retail Ltd A retailer of Nike branded products, wholesaler of footwear, sportswear and apparel, and a manufacturer and distributor of footwear. They pursue appropriate longer-term value creation strategies, which may include unlocking value in their business ventures through public market or private sales. Future Ventures is also looking to invest in more ‘mature opportunities’ in companies which, it believes, have unrecognized growth potentials or are undervalued or in which it can identify hidden assets or recovery potential. The company had consolidated net worth of Rs 738 crore as of December 31, 2010, with the value of investments pegged at Rs 112 crore. For the nine-month period ended in Dec 2010, it had a total income of Rs 399 crore (primarily through retail sales of merchandise from its subsidiaries) with a net loss of Rs 14.67 crore. 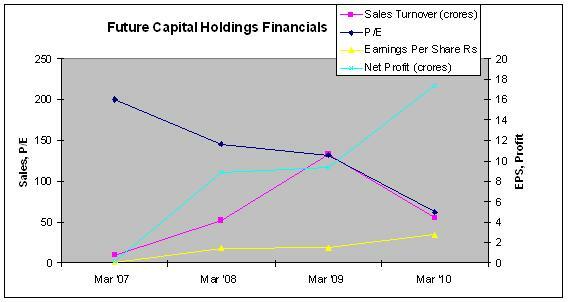 Company officials claim that most of the companies that Future Ventures has invested in are breaking even at the EBITDA level and the results will improve going ahead. /This does seem like a tall claim :-). The company is not expensive at around 1.1x post IPO book value (at upper band). For many portfolio companies, this is very early in the investment cycle. It is actually Private Equity companies that invest in such early stage, high risk businesses. Most businesses are small and are many years and crores of rupees away from break-even volumes, a national recognized brand and profitability. 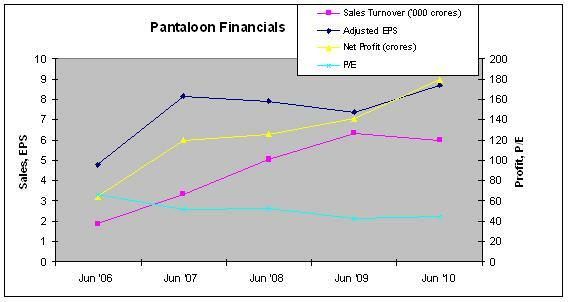 Even with Pantaloon’s clout in distribution, it will take many years of investment to start making profits. Intellectual Property – royalty payments to be made to Future Group for ‘Future’ trademark. While there is a common ‘consumption‘ theme in the Portfolio companies, there are few synergies among them. Eg. A high-end fashion label from a well-known designer has little rub off on Amar Chitra Katha comics for kids or Chinese food sauces. It’s possible that Pantaloon Retail may soon launch a number of Retail formats, but Future Ventures is a shaky ‘backward integration’ for Pantaloon Retail. Maze of portfolio companies, difficult to value and project financials. The IPO has been priced at Rs 10-11 a share. It is open for subscription from April 25-28 for Institutional investors and till April 29 for Retail. Besides various privately held group firms of Kishore Biyani, Pantaloon Retail is the largest shareholder of Future Ventures with 18 per cent stake that will fall to 9.5-10 per cent post issue. Promoters’ combined holding will drop down to around 31-32 per cent post IPO while that of Bennett Coleman & Co Ltd (Times of India Group) will see its 12 per cent stake drop to around 6.5 per cent, according to industry estimates. This is the second attempt by the company to raise money via an IPO. 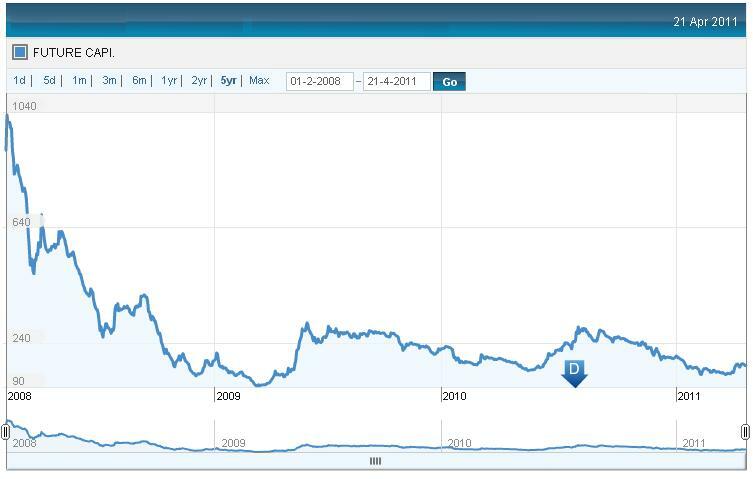 It had earlier filed for an IPO just when the financial crisis began, then cancelled it. 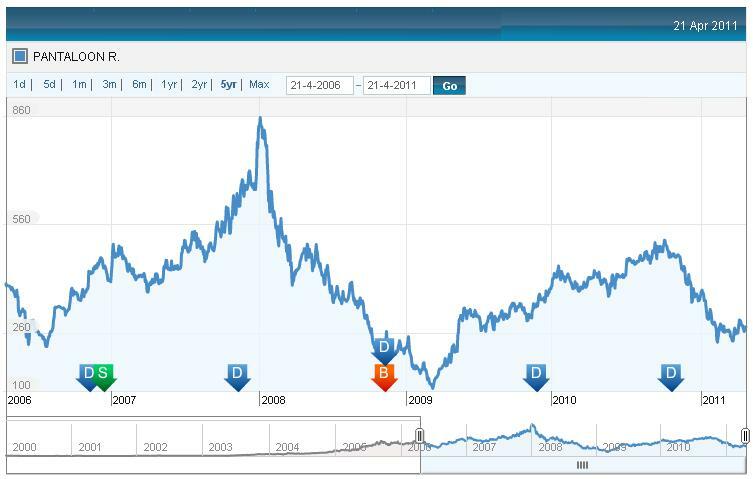 Poor track record of the promoter, of shareholder value creation in previously listed firms. Very nice and detailed analysis.. I like it.. It really help me to take my decision..
Well researched and very nicely explained. I have taken my decision abt this ipo now.